Indigenous people, landowners and youth are resisting a plan to replace a failing oil pipeline with one that's even bigger and potentially more destructive. 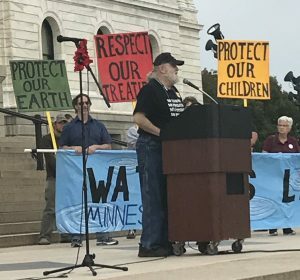 Hundreds of residents gathered in front of the Minnesota State Capitol in Saint Paul on Thursday for a rally to “Hold the Line” against a pipeline project called Line 3. Backed by the Canadian pipeline company Enbridge Energy, the inter-state project was the subject of the city’s only public meeting held later that day, and residents were firmly determined to make their voices heard. With an hour to go until the public hearing, they marched over a mile to the InterContinental Saint Paul Riverfront hotel. Once inside, they argued against the project’s approval to the judge who will decide Line 3’s fate next year. Enbridge is proposing a replacement of its old Line 3, which was installed in the 1960s and is now considered to be inefficient and too costly to remove. Once decommissioned, the old Line 3 would be cleaned and left in the ground and a new $7.5 billion pipeline would be constructed. While taking a slightly different path through northern Minnesota, it would end at the same oil facility in Superior, Wisconsin. Enbridge claims the project is the “best [way] to maintain system integrity while minimizing disruption to landowners and communities.” But many Minnesotans disagree and think the plans for both pipelines raise serious concerns — one of which is the violation of treaty rights. These rights, guaranteed by treaties signed over 150 years ago, include the right to hunt, gather and fish. If a leak were to occur with the new pipeline — which is not farfetched, considering the company’s history of over 1,000 spills — it would jeopardize these rights. Indigenous people aren’t the only ones opposed to the plan. David Johnson, a 70-year-old landowner in eastern Minnesota, first came to know Enbridge about two years ago, when the firm requested use of his land for their failed Sandpiper pipeline, which would have carried Bakken crude oil to the same Wisconsin terminal. The company flooded him with letters and phone calls, but he refused. They even offered him $1,000 at one point. The Sandpiper project was withdrawn last year due to the falling price of oil, but Johnson — still angered by Enbridge and the damaging effects of its projects — is now opposing the company’s Line 3 replacement. He was one of the many speakers at Thursday’s rally in Saint Paul. One of those groups, the Northern Water Alliance of Minnesota, has been focused on the ways in which Line 3 will impact the state’s water resources. Retired architect Jim Reents, who volunteers with the alliance, has testified in front of numerous committees, collaborated with various environmental organizations and assisted in reviewing the effects of the project. What concerns him are the numerous problems associated with the old Line 3. In fact, he said Enbridge admits to over 900 “structural anomalies” with the pipeline. To make matters worse, Enbridge has done little to stop such leaks. For instance, the firm didn’t reduce the pipeline’s capacity — following severe leaks in 2010 — until federal regulators ordered them to do so. Nevertheless, Enbridge called it a voluntary measure. Such carelessness, according to Reents, makes it difficult to trust that Enbridge’s new Line 3 will be any better. “You’re talking about an alignment that essentially crosses the drinking water for the entire state and beyond in many cases,” Reents said. Meanwhile, the crude oil that doesn’t leak from Line 3 will ultimately be burned, producing carbon emissions that threaten today’s youth and future generations. That’s why the Youth Climate Interveners — a group of 13 young activists under the age of 25 — filed for the right to intervene as an official party in a court case against Enbridge in November. The group argued, without legal counsel, that the pipeline would have a drastic impact on their future. The social cost of the pipeline’s carbon emissions alone is anywhere from $52 to $287 billion, according to the Minnesota Department of Commerce. While the next phase of the case is set for early November, Sanders-Reed urged the importance of the public hearings — nine are currently scheduled — across the state in highlighting Minnesota residents’ opposition to Line 3. “If there were ever a pipeline that could turn Minnesota into a leader in clean energy, climate action and the way we treat indigenous rights — this is it,” she said. She then pointed to the examples of resistance to the project happening across the state — from the indigenous resistance camps in the north to landowners like Johnson opposing the use of eminent domain to the formation of a coalition of activists that includes faith leaders and youths. 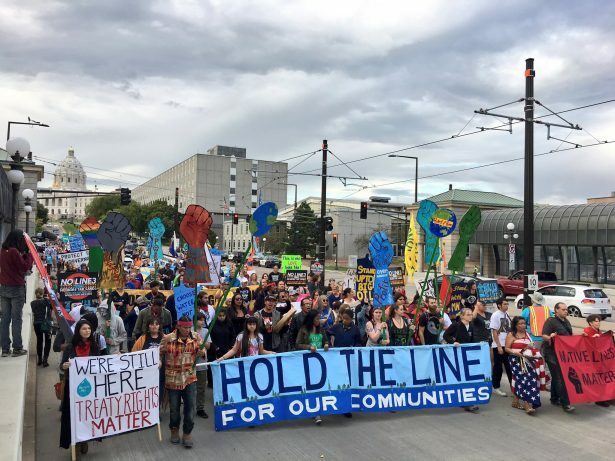 While the public hearing in Saint Paul lasted only a day, resistance to the line will continue. Activists plan to mobilize citizens to attend other hearings in the state, knock on the doors of residents to warn of the plan’s dangers, and take part in the November court case against Enbridge. “There is no way we’re going to let it cross Minnesota,” Sanders-Reed said. You know that Enbridge will try to push this project through as fast as they can before Trump gets his arse impeached! Trump will do his best to ram the pipeline through.